The night of June 23rd is one of the most magical in Barcelona’s calendar, as Christian and pagan traditions fuse with a fun-loving and largely family vibe. Don’t miss it! 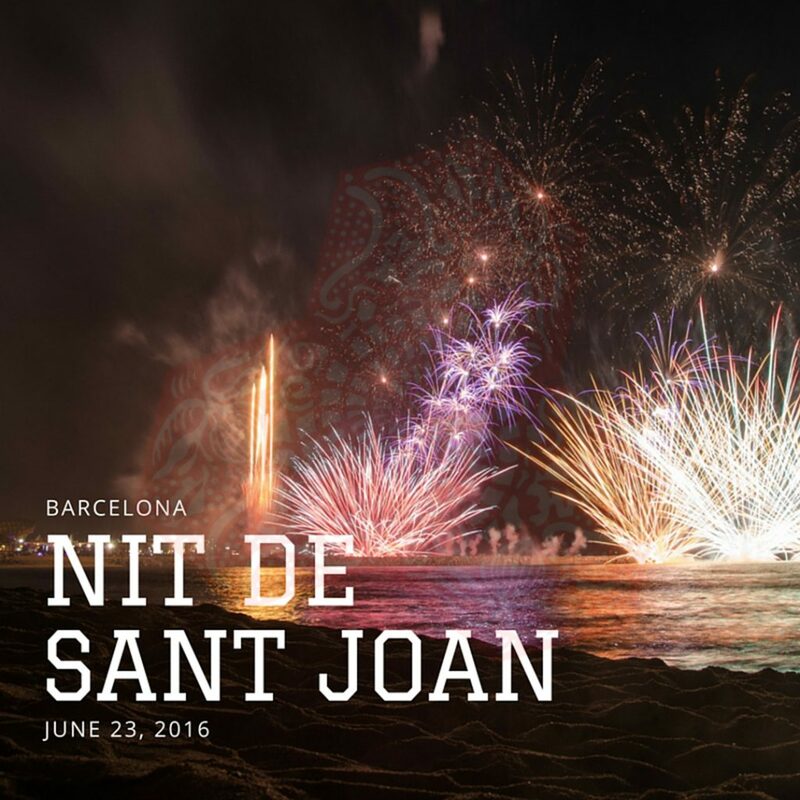 In 7 days time on the night of June 23rd, Barcelona will be alive with festivities as the city celebrates the famous Nit de Sant Joan in 2016. Also known as the Verbenas de Sant Joan in Spanish and La revetlla de Sant Joan in Catalan, the festival takes its name from St John the Baptist; within the Catholic tradition, 23rd of June marks the saint’s birthday. However, it’s likely that the celebration is rooted in pagan rituals, and in particular the celebration of the Summer solstice that occurs two days earlier. These days, the festival sees Barcelona taken over with fireworks, street parties, bonfires, food and music as citizens and visitors alike throw themselves into the spirit of things. Be warned: if you prefer a quiet evening and a good night’s sleep, it might be best to visit the Catalan capital some other time! Fireworks seem to be everywhere on the Nit de Sant Joan in Barcelona, courtesy of the temporary firework shops that spring up like mushrooms in the days beforehand. There isn’t one huge official display: as with the other celebrations, each neighbourhood largely organises its own. City squares are prime locations – if you have no special plans for the evening, keep your eye out during the day for where displays are being set up. If you have a well-placed hotel balcony or can wangle an invite from local friends with a terrace, you could get a great view. You’ll also see plenty of fireworks on the beaches. The flame of Canigo is carried from the Pyrenees to light an estimated 3000 bonfires all over the Catalan regions. Representing the preservation of Catalan culture, the flame arrives in Barcelona in the late afternoon. It’s then distributed to the different districts, with volunteers carrying the flame to light the major city bonfires. Unwanted furniture and other assorted junk meet a fiery end on June 23rd. As the sun sets, bonfires are lit and form a hub for socialising. 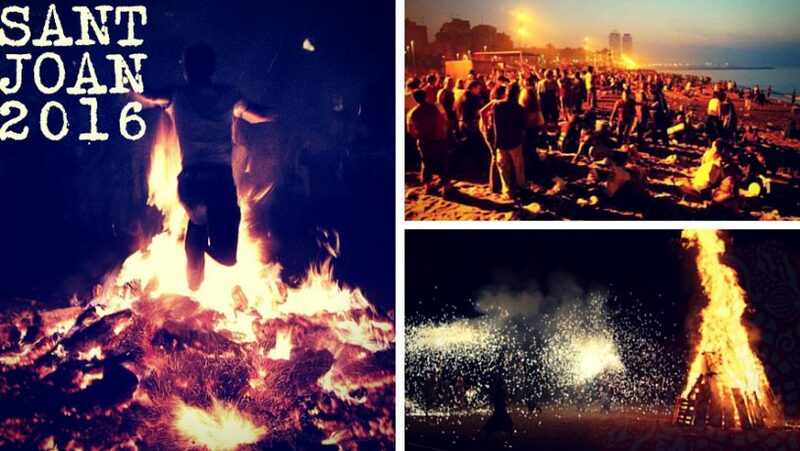 Locals stand, sit, squat, dance, listen or play music, eat and drink while the bonfires roar away. As the night wears on, the more intrepid (or foolhardy?) might indulge in the tradition of leaping over the remains or even brave the embers in a spot of impromptu fire-walking. Look out for La Coca de Sant Joan – a cake based on a sort of sweet brioche. Barcelona manages to munch its way through around 900,000 of these coques during Sant Joan, so they must be pretty good! Traditionally, the cakes are flavoured with anise and topped with candied fruits and pine nuts. Fillings that feature marzipan, cream or chocolate finish the dish off. If you lack a sweet tooth, there are savoury versions too. Make sure you wash down your coca with some ice-cold cava. If you want something more substantial than cake on Nit de Sant Joan, bear in mind that droves of people will be eating out. Ensure you’ve made your reservations well in advance. An estimated 70,000 people head for the beaches on the Nit de Sant Joan. The prime destinations are Mar Bella and Bogatell. Some bars on the beachfront set up temporary facilities to cope with demand, and the beach clubs organise big parties. If you fancy a late night dip in the warm June sea, you certainly won’t be alone, but do remember that alcohol and swimming can be a dangerous combination. With so many people on the beach, space can be at a premium. If you want to claim your own territory, you might want to arrive before sunset. The Nit de Sant Joan is a truly city-wide celebration, with neighbourhoods and communities organising their own celebrations. City squares are prime locations to find bigger events. One of the nicer ways to enjoy the night is just to wander where your feet take you and soak in the atmosphere. If being in the thick of the celebration sounds a bit raucous, you could always head to Montjuïc castle and look down from a safe distance. Party animals, on the other hand, will probably be heading for the beaches. The metro and trams operate all night on the 23rd, so getting around is easy. Taxis, however, may charge a 5€ supplement. June 24th is a public holiday in Barcelona, and the only people doing very much are the clean-up squads. Most shops and many restaurants will be closed, though Maremagnum in the harbour should be open.